A woman from West Sussex has called for more midwives and improved training after she suffered the trauma of a son dying in her womb. Samantha Springall, 27, from Crawley, said her baby might have survived if a foetal condition had been spotted. 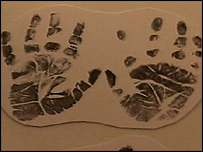 Thomas was stillborn at the East Surrey Hospital, in Redhill. Ms Springall said she was "extremely angry" that midwives had not seen something was wrong. The health trust said it was working to improve services and recruitment. Ms Springall has formally complained to the Surrey and Sussex Healthcare NHS Trust, over what she claimed was inconsistent care from too many midwives. She said she became concerned for her baby when he was two days overdue. "I hadn't felt him move for a few hours and that was very unlike him. I knew something was really wrong." Thomas was stillborn two days later. A post-mortem examination revealed he had intra-uterine growth restriction (IUGR), a condition where the foetus fails to grow properly. Ms Springall claimed he could have been saved if midwives had spotted the signs of IUGR earlier. The NHS trust said: "We recognise there is a national shortage of midwives, however we have recently been successful in recruiting a number of hospital and community-based midwives. "We are also working with Samantha to look at areas where the trust can further improve the services we provide for women in her situation." The Royal College of Midwives said in August that almost 5,000 more of the health professionals would need to be trained in England by 2012, to keep up with a "steadily rising birth rate". The Department of Health said recruitment was up to individual health trusts, but it added the number of midwives employed in the NHS had risen by 2,084 (9%) from 1997 to 2006, while "increased investment in training" was a priority.